Fascinating but gentle, full of the everyday concerns of people ranging in age from 8 to 80 and the tension-filled lives of conflicted people from the past, Whispers on the Dock is the most satisfying story I have read in a long time. Sam, Caroline, and Gracie, the three middle-aged sisters who bought Misty Harbor Inn in Seaside Harmony and opened it in Sunflower Summer, are settling well into their roles as innkeepers. However, Whispers on the Dock is about their personal lives: Caroline’s wedding plans, Sam’s blackberry cobbler, and Gracie’s granddaughter Evelyn. What does Caroline really want her wedding to be like, and why can’t she like any of the houses George finds? Will entering the blackberry cobbler in a baking contest really lead to intrigue and hard feelings, or will Sam be able to live her newfound faith? Why is little Evelyn so very withdrawn? And what about Hannah Montague, the mysterious woman who disappeared from Misty Harbor Inn years ago under suspicious circumstances? These questions, the mysterious inn itself, and old, old secrets fill this cozy book with just the right amount of gentle suspense. 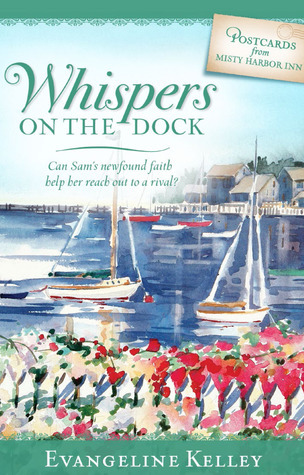 Whispers on the Dock is a lovely novel about family, discoveries, food, love, and faith. I highly recommend it. Please scroll down for information about a giveaway. For more reviews, check out the LitFuse page. Disclosure: I received a free copy of this novel from Litfuse in order to give you my honest opinion. Book three in the Postcards from Misty Harbor Inn series, Whispers on the Dock (Guideposts Books) is now available. Come back to Nantucket and be enthralled by the final installment of the cozy intrigue of Misty Harbor Inn.